You’ll be decked out in style when you slide on these comfortable Slimfitters™ slimming Bermuda shorts with built-in tummy control. These slimming Bermuda shorts have a hidden elastic waist that provides comfortable coverage and a flattering shape. 11" inseam. 74% rayon/22% nylon/4% spandex. Machine wash. USA made. Sizes S (4-6), M (8-10), L (12-14), XL (16-18). 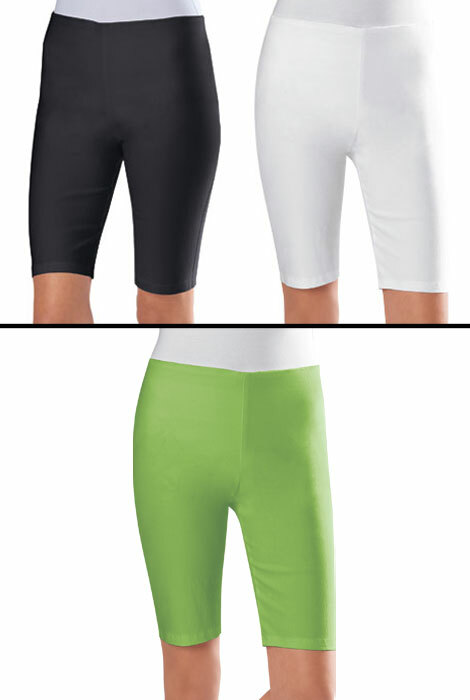 74% rayon/22% nylon/4% spandex. Machine wash. Perfect fit and so comfortable! Will purchase more later. These shorts are a great fabric perfect for resort wear or just every day casual. The fabric is stretchy but with body (NOT leggings)and definitely NOT twill or cotton. 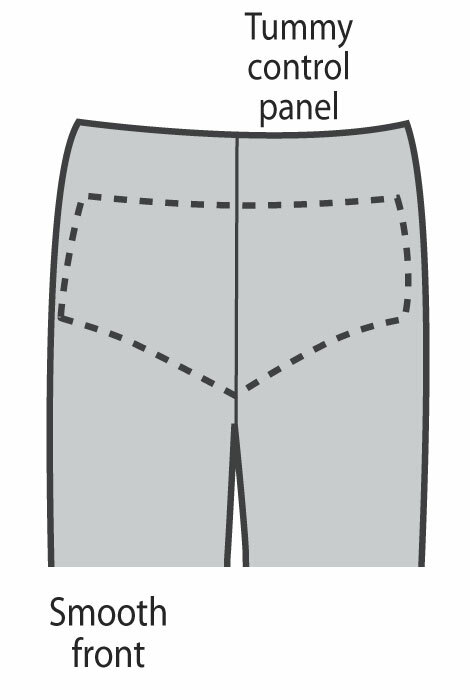 They have no zipper, just pull on with a comfy, FLAT elastic waistband. High rise up to my belly button so no muffin top! I am 5'3", 134# and the M fit perfectly. The black is a deep black (not a faded black) and the white is a very bright white not see through at all! I would love more neutrals!! These are lightweight and great for travel. Please don't change a thing about these shorts. Great quality!!!! These shorts are great. Don't be afraid to order true to size. These are the perfect short option when you don't look great in jeans or capris. I am a bit short so capris just don't cut it, and so many shorts are either too short or too long & baggie. These shorts don't bunch or cling. Great structure. Love them!! Love these pull on shorts! Summer shorts give nice smooth front! Helps smooth tummy bulge. They look fine but I find that the waist band rolls over. I wanted comfort stretch without zipper front. Good reviews. I was looking for the leg length. I have had a difficult time finding khaki colored shorts or leggings to wear with my tunics. I did not order this item. Please take it off my bill. I have another pair; have had for 2 years. Make me look slimmer, wash great!! Like the light weight fabric, length and easy pull on. I already have a pair and love them. I havae ordered these in the past and I LOVE the way they fit!! Liked the colors and the slim fit. need a pair of these shorts to exercise in. They are the only white bermuda shorts I've been able to find! Looked comfortable and had good reviews. I am going to wear them to the beach under a tunic! I absolutely love these shorts. Please get them in more colors! The same colors have been available since my first purchase of these shorts in 2014. They look comfortable and slim fitting. I love these shorts. I have bought many a pair in the past. LOve some of the other pants that I have ordered in the Slimfitters...thougth I would try these. I ordered them before and I LOVE them and get a zillion complements. I am sending the info about them to my girlfriend right now. do you wear this trend under clothing? BEST ANSWER: Unfortunately, I washed and dried it, then it was too small for me. I donated it to Good Will.